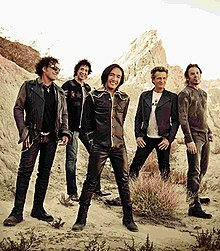 Journey is an American rock/heavy metal band from San Francisco, formed in 1973. They are known for their hit songs like "Don't Stop Believin", "Anyway You Want It", "Open Arms", "Lovin', Touchin', Squeezin' " and "Faithfully". Some of the members used to be members of the band Santana. The band has sold 75 million albums. This page was last changed on 9 December 2017, at 04:47.